I usually write about the beauty of closed-end funds (CEFs) and how we can tap them for yields of 7% or more while also beating the S&P 500 index. Today I want to talk about the dogs of the CEF world. And there are plenty of dogs to talk about—they’ll kill your returns while promising big income streams that aren’t what they seem. It’s a shame, because a lot of these rotten CEFs attract first-level investors who don’t look beyond the dividend yield. As a result, these folks often get buyer’s remorse when they discover those big dividends were actually hiding a grim—and riskier—reality. Let’s start with the Stone Harbor Emerging Markets Total Income Fund (EDI). 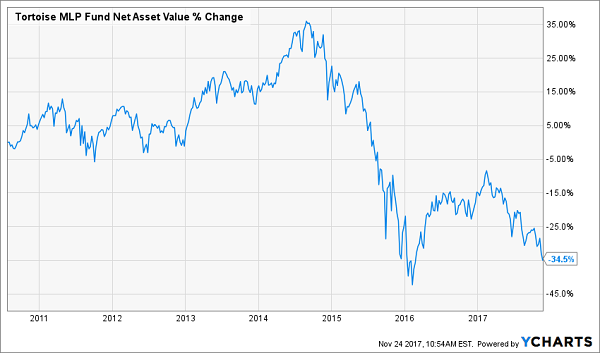 You might notice this fund now because it’s up 24.6% in 2017 alone—which makes it sound like a dream investment, especially when you add on the juicy 11.7% dividend. But the absent-minded market doesn’t care, since it’s priced EDI up to a 2.9% premium to its net asset value (NAV, or the value of the holdings in the fund’s portfolio), while MSD is priced at a whopping 10.5% discount to its NAV. Why is the market overpricing the poorer-performing fund? Simple: dividends. MSD’s yield is a “low” 5.7%, less than half of EDI’s 11.7%. Trouble is, EDI is eating into its assets to maintain that payout, which is why its NAV is down a shocking 36.2% since its IPO. The lower that NAV goes, the harder it will be for the fund to maintain those payouts. That means a dividend cut is coming. And when it does, expect investors to flock for the exits, driving EDI’s price way down. 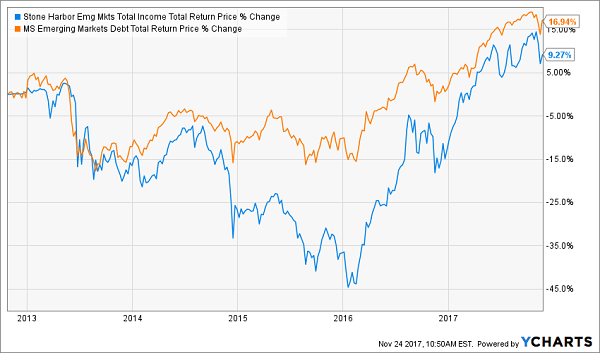 The Tortoise MLP Fund (NTG) trades at a 2.2% premium to NAV, even though it’s been delivering a crummy 1.2% annualized return since its IPO seven years ago. And why is it being priced at a premium? You guessed it: dividends. With a 10.2% yield, NTG is an income investor’s dream … on the surface. But like our first CEF dog, it isn’t earning its dividend from its investments, so it has to take money out of its assets to pay out that income stream to investors. As with EDI, this decline in the fund’s NAV leaves it with less money to invest in the market. That, in turn, makes it harder to generate income to pay investors, and slowly twists the vice on its payout. Since NTG has never cut its dividend—and has actually grown its payout several times—the inevitable dividend cut is going to shock NTG investors and cause panic selling. So don’t expect the premium to NAV the fund currently boasts to stick around for long. 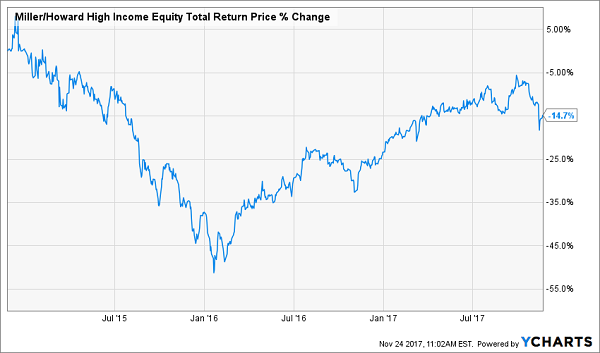 Another investor favorite that doesn’t deserve a place in anyone’s portfolio right now is the Miller/Howard High Income Equity Fund (HIE), which is also trading at a slight premium to its NAV (2.1% in this case). This fund is a dog in so many ways, it’s hard to know where to start. But let’s go with the fact that its portfolio holds some awful assets that have done terribly in 2017, like Royal Dutch Shell (RDS.B), AT&T (T) and CenturyLink (CTL). A bet on HIE is basically flushing money down the toilet. 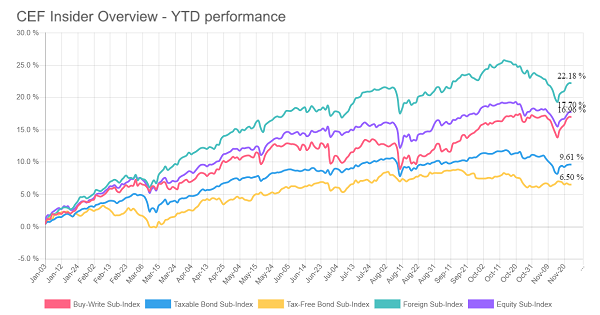 It’s down an average 4.3% per year since it started in 2014, yet the last two years (more than half the fund’s lifetime) have been stellar for the high-yield stocks HIE specializes in! Such underperformance is unacceptable. Yet the market is pricing this fund at a premium. Why? You guessed it again: dividends. 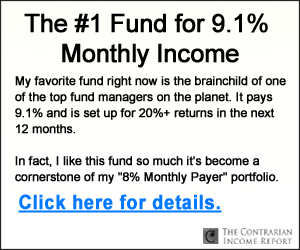 This fund has an 11.1% dividend yield, and the income-starved hordes are overlooking its horrible track record and terrible portfolio because they crave that income. That makes HIE yet another fund to avoid. And these aren’t the only landmines in the CEF space I’m keeping a close eye on right now. 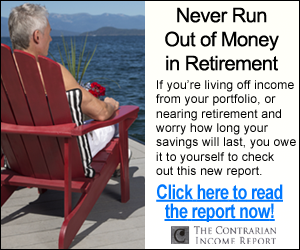 I just released a free special report called “5 Toxic CEFs That Could Ruin Your Retirement,” which reveals 5 more funds with the same deadly flaws as the 3 CEFs I just showed you—dividends on the verge of collapse, fees on fees and, in the case of one fund, way too much leverage, which practically guarantees big losses in the next market storm! Don’t let these 5 dividend disasters anywhere near your retirement nest egg. Click here to get your copy of this new report and discover their names now. And that’s not all. I also want to GIVE you a second special report—“4 Great CEFs to Buy Now: 8.1% Yields and 20% Upside”—which shows you my 4 best CEFs for the year ahead. My favorite of these 4 overlooked funds yields an astonishing 10.4% now and trades at an absurd 13.4% discount to NAV. Considering that this one usually trades at a 1.7% premium, it’s only a matter of time before that bizarre markdown disappears and slingshots this snubbed CEF to serious gains. In fact, I fully expect each of these 4 bargain funds to hand us 20%+ price upside in 2018, in addition to their average 8.1% dividend yields! Let me show you exactly where you should—and should not—invest your CEF cash in the unpredictable year ahead. Click here and I’ll GIVE you your copies of both of these companion reports, including the names and tickers of my best and worst funds for 2018.